Make Me Smile! Chocolate Fruit Spread is made from Fair Trade Organic chocolate and concentrated fruit. Perfect for anyone who wants a delicious chocolate spread without the nuts, dairy, oils and preservatives of some of the well known chocolate spreads. The result is lower calorie and lower fat as well as a rich and fruity chocolate taste. Reinvent your morning toast with this spreadable delight. Made in a dedicated allergen friendly facility FREE FROM Peanuts, Tree Nuts, Dairy, Eggs, Wheat, Gluten, Soy, Sesame, Sulphites, Artificial Sweeteners and Flavors, Hydrogenated Oils and Trans-Fats. 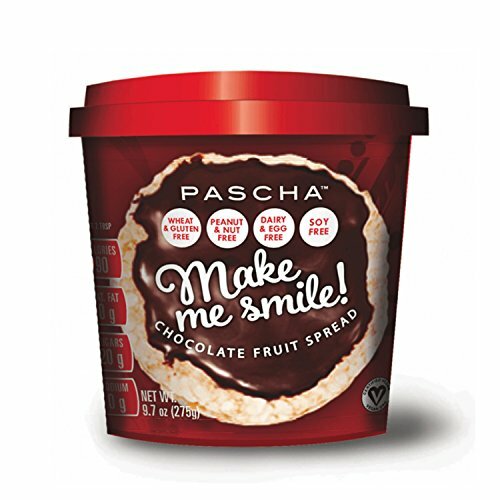 PASCHA's Chocolate Fruit Spread is Certified Vegan, Gluten Free by the Celiac Support Association and Kosher. We are also a member of 1% For The Planet. Great on your morning toast! If you have any questions about this product by Pascha, contact us by completing and submitting the form below. If you are looking for a specif part number, please include it with your message.